I was so happy when I found these food at Walmart Store one night while we did our grocery. And immediately, I put it in the cart and brought this little fella with me. 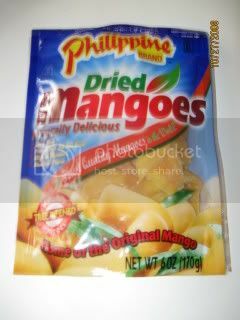 I really do like mangoes, dried mangoes and proud that at least some of the Philippines product were at the foreign stores. My husband don't like mango at all, even if you gave him the sweetest mango fruit it's not his thing. So I ate this dried mango by myself. I can't wait to buy more and share it to my other in-laws who haven't tried this before.